Health officials have discovered the virus has spread some 90 miles from the rural area where it was first reported last week to the crossroads city of Mbandaka, which is home to more than one million people. "Mbandaka is on the banks of the Congo River and that means that it has connectivity right through to Kinshasa, in the Congolese hinterland, a town of more than 10 million people and it also connects through to neighboring countries such as the Central African Republic and Congo Brazzaville. So, this is a major, major game changer in the outbreak," says Dr. Peter Salama, deputy director-general of Emergency Preparedness and Response at the World Health Organization (WHO). The news prompted an emergency meeting at WHO so health officials can determine the risk to the region and the world. 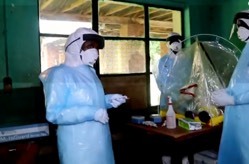 So far, 45 cases have now been reported in Congo, and 514 people believed to have been in contact with those infected are being monitored as epidemiologists work to identify additional contacts. Four-thousand doses of Ebola vaccines have arrived in the country and thousands more are on standby if needed. "We're certainly not trying to cause any panic in the national or international community. What we're saying though is that urban Ebola is a very different phenomenon to rural Ebola, because we know that people in urban areas can have far more contacts. So that means that urban Ebola can result in an exponential increase in cases," Dr. Salama continued. This marks the ninth Ebola outbreak in Congo since 1976, but just the first-time people there have had access to vaccines, which have shown to be very effective. Ebola is transmitted to people from wild animals like bats and monkeys. Humans then transfer it to each other through bodily fluids. In most cases the virus is fatal.